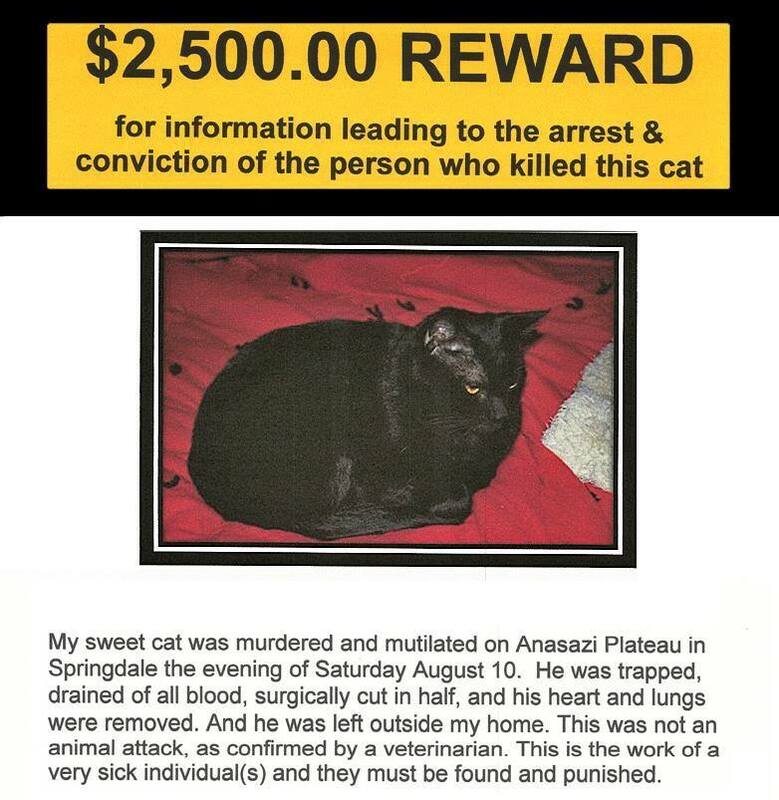 SPRINGDALE – The reward being offered for information leading to the arrest of the person or persons responsible for mutilating a Springdale woman’s cat has been increased to $5,500. The cat’s owner also said she plans to have a forensic test done on the possible DNA found underneath the cat’s claws. The Humane Society offered the reward money to assist in capturing those responsible for mutilating Teresa’s cat Khepri on Aug. 16. The potential case of animal cruelty has had the Anasazi Plateau neighborhood in Springdale on high alert since the cat was found severed in half. Teresa said her cat was trapped, drained of blood and surgically cut in half, then his heart and lungs were removed before he was left outside her home. When Khepri, who normally wakes Teresa up in the morning, was nowhere to be found on the mor ning of Aug. 17, Teresa said she finally discovered her cat’s brutalized body outside her home. Teresa, a wildlife biologist, said after closely looking at her cat’s body, she knew the mutilation could not have been done by another animal. The report from Khepri’s autopsy, performed by Wittwer, said all of the cat’s organs had been removed except for the colon, and there was no blood pool and no punctures on the remaining body. Springdale Police Sgt. Garen Brecke said the case is under investigation, and the Springdale Police Department has never seen anything like this in the area before. Brecke said he doesn’t think the Police Department would perform DNA testing in an animal cruelty case. little too late now!!! smart comment! What would the testing cost? Can some of those funds be diverted to cover the costs? Can the owner start a ‘pitch in account’ online for us to contribute to….I’m down for $5. My instinct is that this was a religious ceremony performed by some sort of cult. Every pet owner in the area is probably locked-and-loaded right now. They won’t do it again. I wouldn’t be surprised if the culprit was some church kid. Eh, I’d say probably a bishop of a local ward. Sounds to me like someone knew this was her cat and has something against her. Sounds like pure envy to me! There is a very wicked and deranged person/group of people that need to be caught. I would chip in also to help find out who did this. Also why does every story have to have a Mormon slammer comment? You act like fools when the issue is about the insane act of this pet owners cat and the creep behind it. Where do I donate? You know what guys, no one is immune to tragedy. If you are going to joke about something this horrible then be sure to make a mental note of it. When karma finds you, then you can read people’s opinions on a faceless online newspaper’s comment section. It takes a total coward to joke about torturing an animal. Adult abusers started by abusing and torturing animals. Whoever did this needs to be caught ASAP! Cannot let this demented individual progress onto human victims. Sherry, you should definitely do the DNA test. You have the means and the knowledge. Some around you is a very sick psycho! Do you think he was used by a Vet Student? Also what do the crossed over Paws mean? Someone that puts that much thought and detail into this cruelsome act is highly dangerous! I think the Police Dept should def help you with the DNA test. This is not a normal animal cruelty case. This is a freaking psycho walking the streets! Hope an accidental bullet from the Cops will hit him. He’d deserve it!!! God this makes me sick to my stomach! I would look close around you. And if you don’t own a gun, get one! Please keep us updated on this case. This is a definite sign of a future serial killer right, here in the making, we have a hometown serial right in are backyard what a way to put saint George on the map once this guy really does something much worse. I agree that this is the work of a sadist, disturbed person. Not likely a cult. I worked at a maximum security mental hospital for the criminally insane, Animal cruelty is a precursor behavior. Law enforcement should prioritize their search, arrest the perp and the legal system should place them in a psychiatric institution with release decided by a team of forensic experts. Not in a correctional facility with a sentence decided by a judge.